Why We Offer A FREE Pre-Retainer Consultation. We know you want to feel confident in the expert you retain and hire on your case. A short introductory phone call is normally sufficient to satisfy even the most experienced trail attorney that Bob Baier is articulate, competent, and rock-solid on the stand. However, most cases don’t go to trial, but you still need someone experienced, honest, and has the expert eye to see the facts and present them in a declaration or written report. Please call Bob Baier or email your questions right away. Mr. Baier’s time is valuable and meeting new clients are an important part of his schedule. For most clients (including attorneys), a brief conversation with his highly trained and experienced office staff will answer all your questions. 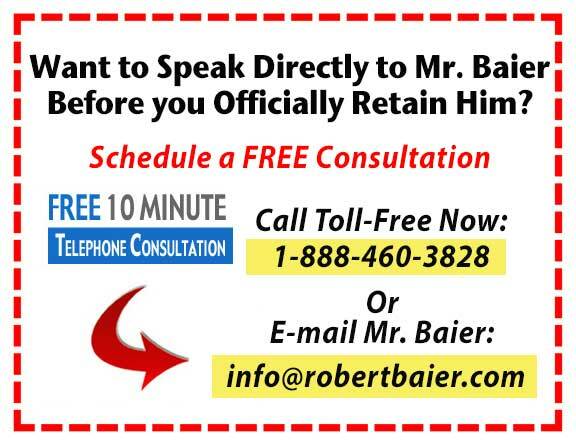 If you want to meet Mr. Baier via phone before you make the decision to submit retainer payment and your documents, that is acceptable and easy to arrange. Because forming an “official opinion” is both time consuming and legally binding, Mr. Baier’s policy is to not visually review any documents at the “pre-retainer” stage of the case. Please do not email your documents as part of the Pre-Retainer Consultation. Only email your documents after your have retained Mr. Baier. However, you can discuss details relating to your case and discuss any unusual circumstances which might be important to disclose. Mr. Baier has invested years of training in order to have his team answer your questions and work with clients while he is “in court” or “on assignment.” Call our office and trust you are in good hands when you are speaking directly to him. Call our office directly today. feel secure in hiring us for your case.